I had just boarded the plane and was heading west for my Saskatchewan speaking tour. I squeezed myself into what seems like are becoming increasingly narrower plane seats. I began to pray, “Oh Lord please don’t let me have some jumbo sized person as a seat mate today.” I am not being mean, just selfish. I had work to do and did not have the energy to fight with a Japanese Suma wrestler for the armrest. As a man the size of a VW Beetle waddled right by I said beneath my breath, “Thank you Jesus.” A tiny Chinese young lady came on the plane and I said, “Yes Lord!” But it was not to be. Then an almost inhumanly gigantic creature of mythical proportions stopped at my row and said, “I think I am with you.” He folded his massive sinewy athletic frame into the aisle seat and his 5′ broad shoulders displaced my entire torso pressing my bewildered face up against the window as I gasped just to breathe. 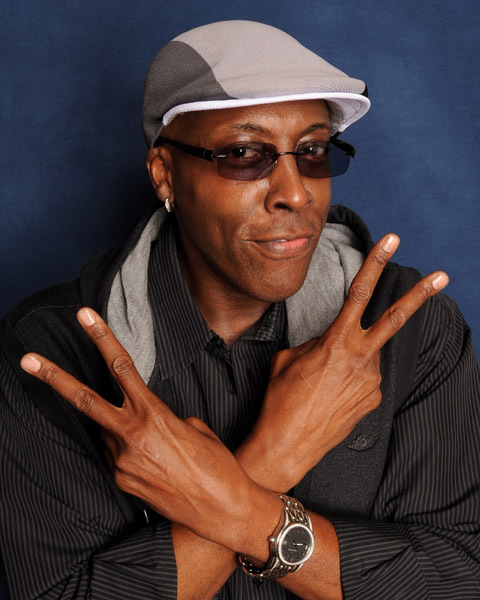 I could not help but notice the size of his callused hands which would make Arsenio Hall look like he has baby hands. So from my tiny corner of the universe I began reading a boat magazine. My new seat mate asked me if I had a boat. I said, ‘Yes, a speed boat,’ and asked him the same question. He told me he preferred human powered boats. “You mean kayaks or canoes?” I responded. “Something like that,” he said. Something like that indeed! 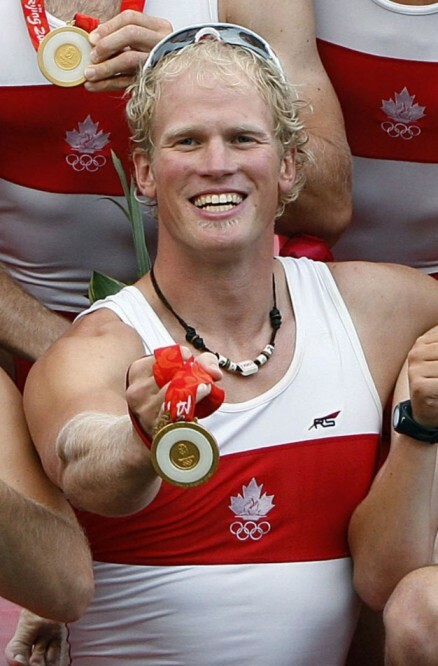 To make a long story short, I was sitting beside Adam Kreek the gold medalist for 8 man rowing from the 2008 Beijing Olympics. Adam is now a motivational speaker and he crosses the country sharing the story about their victory for Canada in Beijing. It was not an easy journey. After winning the world championship in 2003 they went into the 2004 Athens Olympics favoured to win the gold. They came in 5th. They continued to train 6 days a week and in 2007 won the world championships again. Favoured to win the Olympics in 2008, this time they made no mistake and won the gold by half a boat length. It was a great story and I loved hearing it first hand from the very one who lived it out. Adam had his Powerpoint presentation open on his laptop and I noticed a page titled Gold Medal Syndrome. I asked him about it. He told me that GMS was the belief that you will be a different person after you win the medal than you were before. When Olympians discover that a gold medal hasn’t made them into a different person they often go into a depression. He said winning the gold medal was the greatest 4 hours of his life. “Then what happened?” I asked. “After that,” he said, “nobody knew who I was.” I then mentioned that it would probably come as a huge surprise, but that I had never actually won an Olympic gold medal myself and I wanted to know how GMS would relate to me. He explained how it doesn’t matter what we do in life we are not different people after our accomplishments and we had better find our identity somewhere else. It is a great message for all of us to keep in mind. The true measure of a person is who they are inside, not what they do or achieve on the outside. 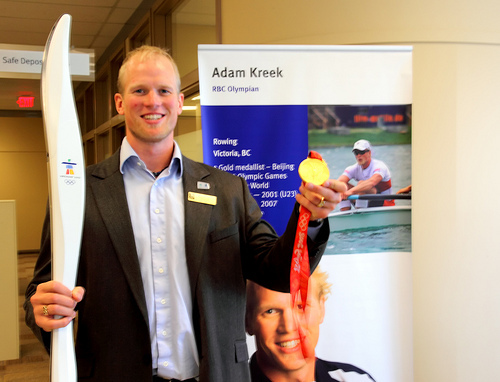 I really enjoyed my visit with Adam Kreek. Here was a young guy with his head really screwed on right. He knew a lot about victory, and defeat (not to mention a great deal about team work) and consequently knows a lot about life. At the conclusion of our flight he asked me if I had ever held the Olympic torch. I told him I had left mine at home. Then to my surprise he pulled the Olympic torch out of the luggage rack overhead. His Beijing team was given the honour of carrying the torch on the first leg of the Vancouver 2010 Olympic Torch Relay. Because he is the one sharing the story, they gave the torch to him as a keepsake. I am quite certain that holding the Olympic torch is as close as I will ever get to being an Olympian, but for a few moments I got to touch the glory, and as it turns out that’s all anyone gets… just a few moments.